Celebrated Korean stars such as Song Hye Kyo and Song Joong Ki chose The Shilla Seoul for their newsworthy nuptials. 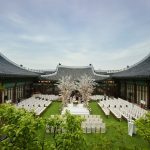 For couples planning to tie the knot, The Shilla Seoul, Korea’s leading luxury hotel, offers couples a unique blend of Korean hospitality and state-of-the-art technology as well as an expert team of event planners to oversee every detail of the special day. Whether couples are planning a small ceremony or a lavish affair, The Shilla Seoul boasts a variety of venues, catering options and packages to suit every taste and any budget. Stylish banquets come to life with the help of The Shilla Seoul’s in-house art director and chief florist, both dedicated to creating unique individual settings, and customizing each display to suit the couple’s preferences. Prospective brides can also shop at the Arcade, conveniently located on the hotel’s lower level, a one-stop outlet featuring a selection of nuptial necessities, from traditional Korean costume to photo services. With its traditional Korean architecture and sophisticated interiors, The Shilla Seoul’s exclusive event venue, Yeong Bin Gwan, can cater to every type of wedding. Capturing the picturesque landscape and vibrant history of Korea, Yeong Bin Gwan conveys the splendor and grandeur of the country’s royal palaces. The architecture comprises two floors in traditional Korean style, with a façade reminiscent of the Shilla era. The roof and walls are adorned with delicate paintings detailing Korea’s ancient dynasties. 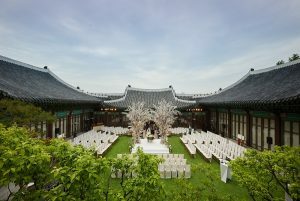 Beyond the entrance, the space opens up to an impressive hall that extends into a majestic garden with a fountain centerpiece, creating the ideal wedding venue in the heart of Seoul. Aside from the gardens, three spectacular function halls also introduce visitors to traditional Korean design. Within the Yeong Bin Gwan complex, couples can choose from the Ruby, Topaz or Emerald Rooms. For couples planning a more elaborate wedding, the Dynasty grand ballroom can transform into an ornate hall for a lavish banquet.